Store and Go basic is the innovation for maintenance and care for your brushes. After cleaning, brushes can be stored perfectly in the brush gel: for a day, a week or even months. 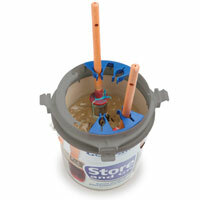 To keep gel and brushes fresh, we advice to clean the brushes thoroughly with our Clean and Go system. To continue painting: wipe off all gel from the brush into the spare pot and thoroughly clean the brush by using a cloth. Brush is ready for use. Store and Go basic is suitable for all types of decorative paints and brushes (excluding moisture cured and 2K paint systems). 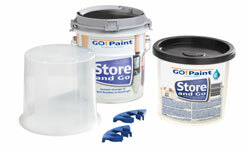 The Store and Go gel stays fresh for approximately one year in a airtight container. Keep Store and Go in a cool, dry and frost-free place. Store and Go gel is water based and made from natural and renewable resources only. It is eco friendly and can be disposed by following the local facilities.